You can integrate calls, SMS and recordings into every workflow inside Zoho CRM. The babelConnect app will respond in real-time to each context. Inbound calls that are routed to an agent will be displayed in real-time with customer information. You can select any contact inside Zoho CRM and call them immediately using one click calling. But it is not just a phone app. You can get detailed control of call recordings. This allows you to do almost anything with recordings: ensure compliance with both consumer data protection, PCI requirements and any industry specific needs around recordings. On top of that, you can tag recordings, flag them for assessment and create automations that run in the background to make sure the recording is associated with the right data. babelConnect also gives you the ability to send SMS directly to contacts and to have 2-way SMS communication. You can also automatically dial any list of leads or contacts and connect the calls to an available employee. This can be used as well as click-to-call within Zoho CRM. If you wish to do outbound calling campaigns for sales, retention, customer care, debt collection, direct research or any other process, you can automate the entire processing of the contact items. For example, if you capture leads or save call-back requests from your webpages, then you can automatically schedule these requests. Your employees do not need to waste time on manual list management. Even better your agents do not waste time on the many no answer or busy call outcomes. Why do something manually that is better left to a machine? Everything about calls and agent availability is real-time. So instant monitoring capability for calls, queues, agents is vital. Being able to put real-time data points in context with calls from the day so far is also important. 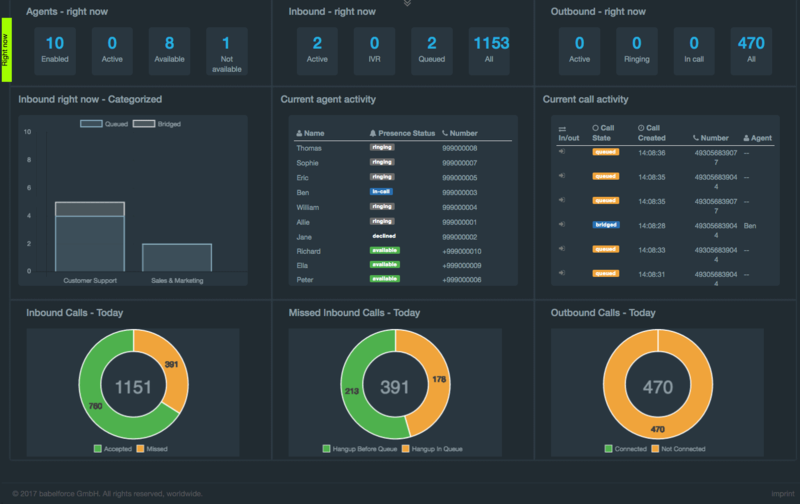 babelforce dashboards for your Zoho CRM call processes gives you the ability to get this monitoring out-of-the-box and in a format that is ready to put on big screens on your walls. You can also create different dashboards for different purposes: sales and other outbound campaigns are very different from inbound call queues. It is often best to have specific views to monitor each type of process. Request a demo and we will help you to build the most complex of integrated processes in Zoho CRM.